So here we are at the North Bend Bar & Grill. Jessica and I were out for date night (it was Wednesday). 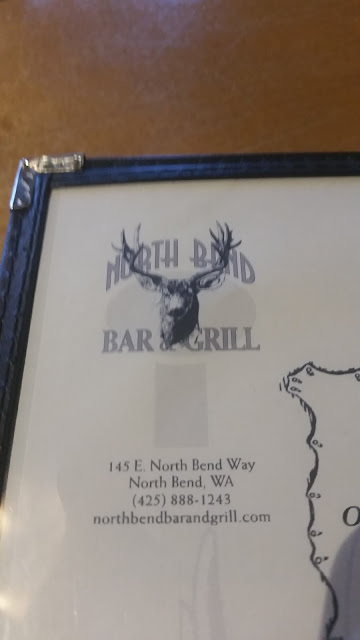 We went to North Bend to check things out down there. It's a cute little town. Pretty limited but cute. 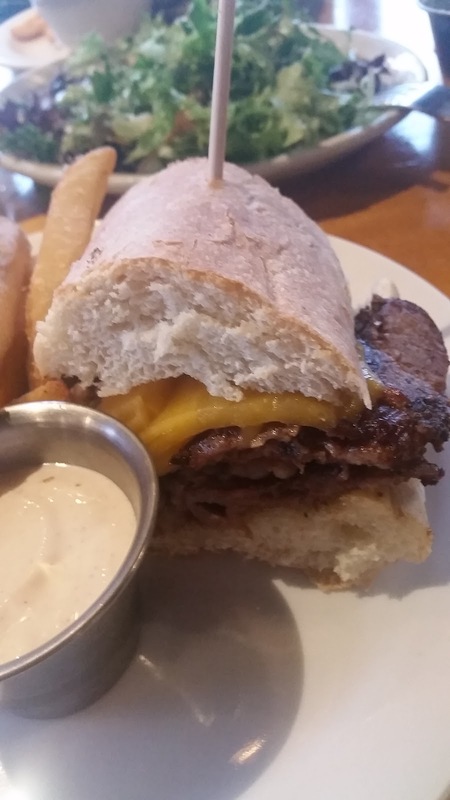 After enjoying clams as an appetizer, I zeroed in on the Prime Rib & Cheddar Sandwich option. I had been in a "French dip funk" (I will explain later) and thought I might need to do it. I wasn't that hungry so Jessica and I agreed to split that there French dip, plus it came with fries and a salad so we were good. 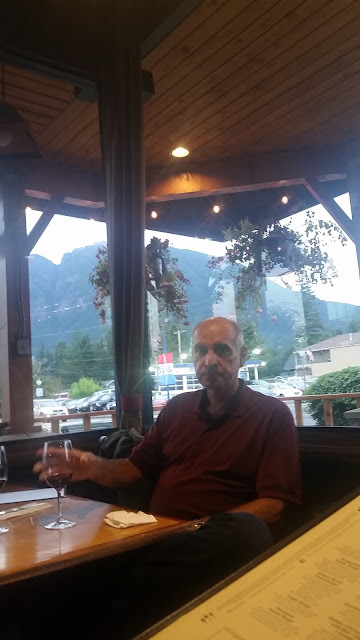 While we were getting settled I ordered a Rainier pint. 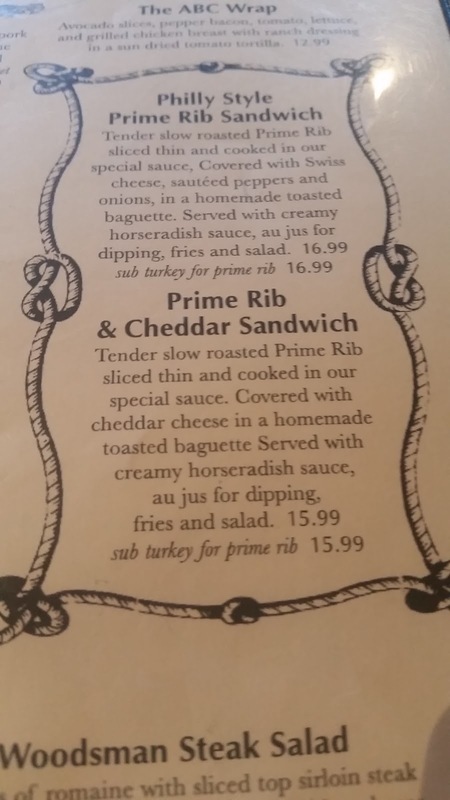 So I had two choices for the dipped prime rib sandwich au jus. I wasn't feeling up (at all) for the peppers and onions and even had a hard time talking myself into getting a sandwich with cheddar on it (was feeling like more of a purist that night). So I went for this bad boy. 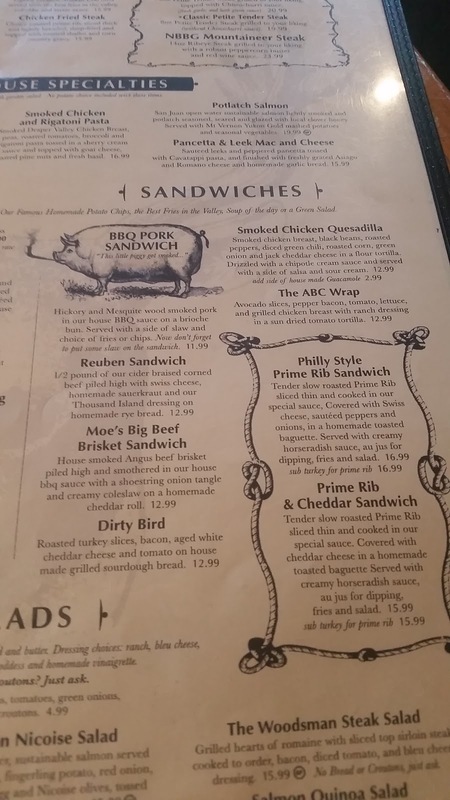 I see that they also have a turkey option, which I am sure is good. But the prime rib wound up being pretty good meat, not surprisingly. 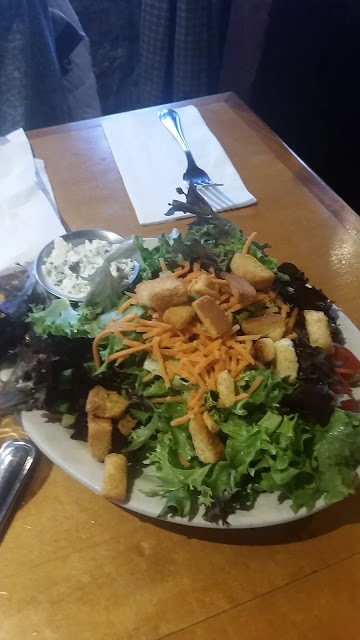 Our waitress brought out the salad, which was quite nice looking. That is carrots you see, not cheese. And the lettuce was hearty and nice greens. 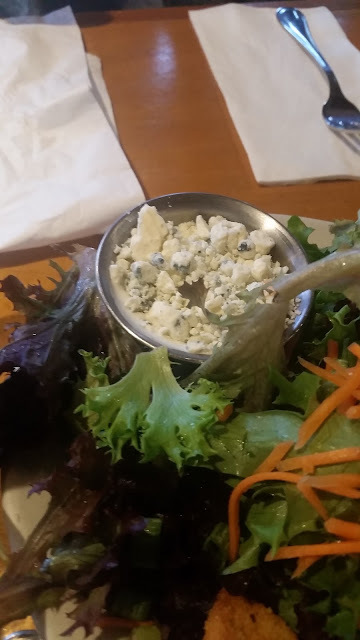 At first I was afraid that she had only brought out bleu cheese crumbles and the salad might be dry but this was just a (really) nice touch they do to their bleu cheese dressing is to top the serving container with the crumbles. And it wound up being a very good salad! 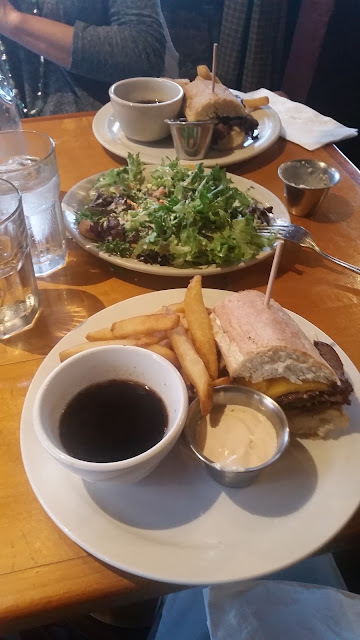 As I mentioned, Jessica and I had agreed to split the French dip so we were both presented with a nice plate, good portion, good looking jus, and fries. I wasn't so hungry, so this looked like a really good amount of food and Jessica even took half of hers home but she eats like a bird, sorry Jessica dear. A close-up of the jus. 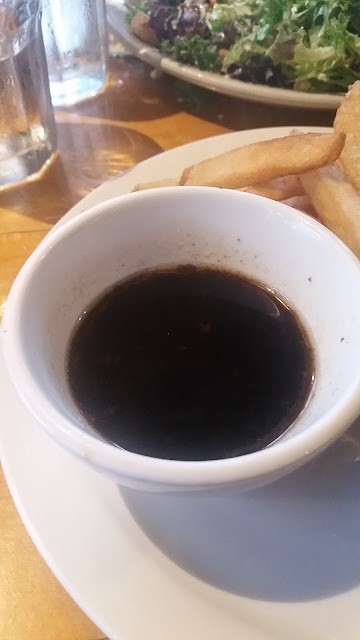 It was served in a fine, classic container, it was dark, looked quite hot, smelled good, looked rich, good, etc. So I felt pretty confident that it would be good and it was indeed good. It was perhaps overly salty but in general it was good jus. When it comes to jus, it is better to err on the side of too rich rather than too bland. Here's a close-up of the sandwich and the creamy horseradish sauce to its left. The creamy horseradish was actually quite good: pretty spicy, etc. with a good kick but I prefer the non-creamy varieties of horseradish and as someone who in general does not like most foods overly rich or creamy. The bread looked quite pretty, the cheese quite nice and the meat nicely crisped and such. In general I was a fan of the presentation and felt like it would be a good meal. I don't know this man. I was trying to take a picture out the window of Mt. Si behind him and he awkwardly looked over at me right as I was taking the picture so that didn't go well. Sorry, dude, I hope you enjoyed your hamburger, conversation and glass of wine! Salad good. It was a really good, nicely presented salad with nice ingredients and a fancier-than usual dressing that included a blue cheese crumble topping. Jus good. The jus looked good, hot, rich and thick upon serving and was delivered in what would be a proper container. I wrote down that that jus was "really good" and it was also really salty. I think we don't grade down jus for being overly salty unless it is really like over the top screwed up salty. Meat good. The prime rib was indeed really good when eaten alone and seasoned quite nicely with a salty but good flavor. The prime rib was prepared medium well and gets a strike against it because I was not presented with the option for it to be medium rare, etc. And then there was the bread. Now the bread on the other hand looked okay overall and was of high quality but in general had a "floury" taste (and visible flour) and it was non-French. It was especially spongy and not very porous (sidebar: it's called porosity or void friction and needs to get added to the metrics page). You don't want an overly absorbent bread, which this was. It wasn't too soft but it was also not buttered much if at all and it wasn't very toasted. The bread did not ruin it for me but it also did not make or really help the sandwich in any significant way; the highlights were the salty meat and cheese and the quite rich jus. Horseradish cream was there, but whatever. As I previously mentioned, the horseradish cream was good but of the creamy type and had the right amount of spiciness. But I did not really splurge on it (one dip, I believe) as it is not really what I needed or wanted at the time. Fries. It was nice that they gave out both fries and a very salad. The fries were only okay with some a bit on the mushy side. As is my basic custom, they were dipped into ketchup. Mustard was not on the table I don't believe and had it been I would have most likely used that mustard for dipping my fries into, okay? Overall sandwich dipped. This sandwich was a 4 of 5 overall. It loses points for the bread primarily. In general, this was a high priced meal at $15.99 but because it came with fries and salad, cheese, prime rib and the size was pretty good, it is not entirely outlandish, especially for the Seattle area. It was also a nice feature and touch that they split it between me and Jessica and each portion was quite generous. Bread. I score the bread as a 2 of 5 for a few reasons: quite white in color, not buttered much if at all, not toasted much, not very crunchy, had some taste like flour, overly absorbent. Jus. The jus I will score as a 4 of 5 primarily due to its saltineess but in general it was rich and good. Meat. The meat gets a 4 of 5 for being crunchy and nice and salty and tasty and prime rib. It could have been better had I been given the option to choose doneness but overall it worked very well with this sandwich and was enjoyable. Cheese. I give the cheese (non-meat topping) a 4 of 5 given its quality, thick cut and value-add to the sandwich. So there you have it, dear Mr./Mrs./Ms. reader person. I hope you enjoyed the review and will enjoy a French dip of your own very soon. Or at least a conversation about one.